This is a survey setting that you can use to add one or more translations to your survey, instead of creating multiple surveys and handle the different languages separately. You can translate your questionnaire to all the languages that you need and get a complete result instead of having to work with multiple survey results. It also gives each respondent the opportunity to respond to the survey in the language of their choice, provided that the language have been added as a translation to the survey. There is support for more than 70 different languages that you can select. Where can I find Multi language settings? Note: This function is not a standard feature for all license types, so if the Multi language settings button is greyed out and not clickable it is because it is not activated for your company license. If you have questions or want to activate the function, contact your company’s Customer Relations Manager or send us a message here. How do I use the Multi language settings? To use the Multi language settings you will need to begin with creating the questions that you wish to use for your survey and make sure that the material is correct. It will be much easier working with the translations if you have the questions corrected before you start setting up additional languages. If you edit questions within the survey after the translations have been entered, they will be lost for the changed question. A re-entry of the translations of this question becomes necessary. Language: This is the language that you wish to translate the survey to. Just select the language that you want to use in the drop-down list. Language presentation: This is the text that respondents will see when selecting language. You can enter the language name or a more descriptive text, if you so choose. For example, “English” or “Click here to answer in English”. E-mail to contact person: This option is if you want the contact person to be different for the selected language than what is selected in the survey settings. If you do not want to use a different contact person, just leave this field blank. Enter web address for redirection after completed survey. (optional): This option is if you want the survey redirect to be different for the selected language than what is selected in the survey settings. If you do not want to use a different an alternative redirect for the translation, just leave this field blank. Show flag: This will add a flag to be presented to the respondents on the language selection page. The flag will be automatically added based on the Language you have selected. Active translation: This will activate the translation on links to the survey making it possible for respondents to select the language on the language selection page of the survey. We recommend you to wait with activating your translation until you have secured all translations. Translation info: This is internal information about the translation. It will not be displayed to respondents in any way. Direct link to the translation page: After saving, a link will be displayed under this heading, which you can forward directly to a translator in order for them to add translations directly to the tool. This link will not work on currently active translations, so make sure you have not activated your translation before using this link. Once these settings are comp and the questionnaire will be displayed. Under each element of the survey you will have an input field in which you can enter the appropriate translation. Just enter a text in each of the boxes and these translations will be displayed for the specific language. If you leave a box empty, the original text from the master language will be displayed. To save your work, click Save translation. There is no automatic save on the translation page so it is important to remember to save your work regularly. Click Back to go back to the translation overview where you can see existing translations or add more languages to your survey. Second step after adding a translation, it will be possible to customize your “master language”. This is the main language of your survey, and the language that you have created all your questions in. To do this, simply input the name of the translation that should be visible to the respondent in the box called Language presentation and if you want there to be flag represented on the selection page, tick the box for Show flag if you want the flag displayed on the language selection page of the survey. 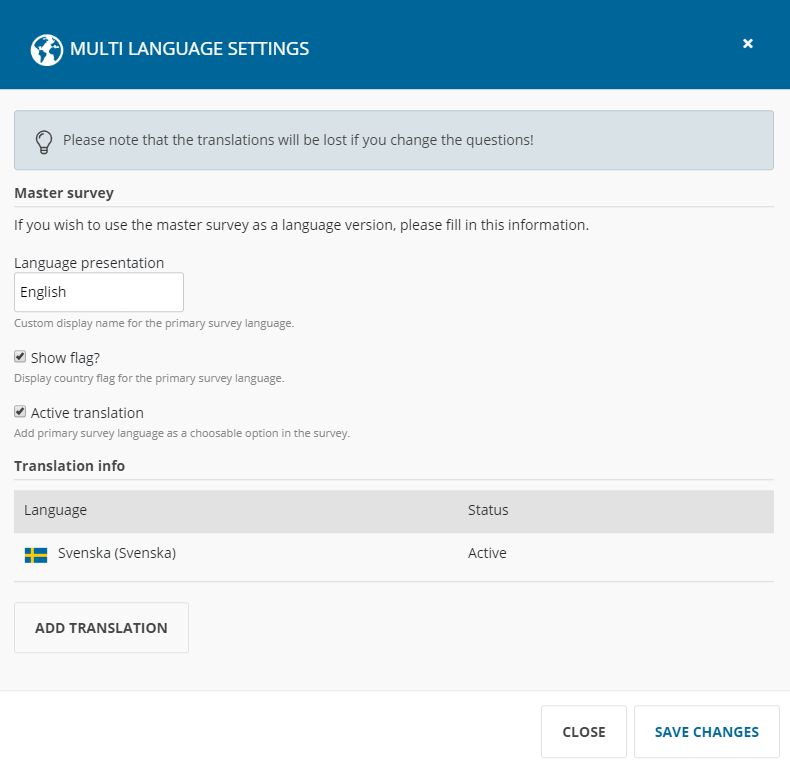 The last option called Active translation will activate the Multi language module on links to the survey, displaying a language selection for respondents. When these settings have been completed, click Save changes to store the settings that you have done.